RV hypertrophy (RVH) is one of the triggers of RV failure in congenital heart disease (CHD). Therefore, improving our understanding of the cellular and molecular basis of this pathology will help in developing strategic therapeutic interventions to enhance patient benefit in the future. This review describes the potential mechanisms that underlie the transition from RVH to RV failure. In particular, it addresses structural and functional remodelling that encompass contractile dysfunction, metabolic changes, shifts in gene expression and extracellular matrix remodelling. Both ischaemic stress and reactive oxygen species production are implicated in triggering these changes and will be discussed. Finally, RV remodelling in response to various CHDs as well as the potential role of biomarkers will be addressed. It is estimated that about 1% of all live-born babies are affected by congenital heart disease (CHD), 30% of the children with CHD require intervention in the first year of life and those who have successful cardiac surgery have an increased risk of dying in teenage years, often due to RV failure.1 RV failure can be a consequence of congenital disease or can be triggered by pulmonary arterial hypertension (PAH) where the long-term outlook of the patients depends on the ability of the RV to cope with the high pressure.2 Despite the recognition of the critical role played by RV dysfunction in outcome from CHD, little attention has been paid to RV remodelling. Most acquired cardiovascular diseases affect primarily the LV and it has been previously assumed that mechanisms of LV function/dysfunction can also be applied to the RV. The RV and the LV have different embryologic origins. The RV originates from the secondary heart field and the LV from primary heart field. Since the RV normally faces a low impedance pulmonary circulation and is a low-pressure chamber, the walls in this chamber are thinner than in the LV, which is designed as a high-pressure chamber. Additionally, the RV has a different metabolism and morphology (eg, helical muscle fibre arrangement).3 Therefore, it is not surprising that, as a result of these anatomical and physiological differences, the two chambers display different responses to adverse conditions. In view of this, there is now acceptance that impaired RV functional status can contribute to the prognosis of CHD. Interestingly, the National Heart, Lung, and Blood Institute working group attempted in 2006 to define the scientific and medical basis of RV function/dysfunction in the adult population and to approaches of investigation in order to improve knowledge. However, despite major advances achieved in recent years in the knowledge of RV pathophysiology in adult, there is still a lack of information in the field of RV failure in paediatric CHD. The changes in the pulmonary arteries arise from persistently increased pulmonary pressure due to high left to right shunt.5 The main CHDs associated with RV pressure overload include: PAH associated with this left to right shunt, in RV outflow obstruction (eg, as in tetralogy of Fallot (TOF)) and where the RV is the systemic ventricle (SV). Although all these three diseases are associated with RV pressure overload, the underlying pathophysiology is clearly different. We do not yet fully understand how or why the RV responds to the different stimuli. For example, in PAH, the RV loading conditions will be very different at rest in response to non-compliant pulmonary arteries, which cannot accept the increased cardiac output demanded in exercise. Exercise-induced symptoms are marked in PAH. However, in pulmonary stenosis, the pressure loading is found predominantly in systole and even at rest. Exercise-induced symptoms are absent in pulmonary stenosis, until very late in the disease process. In such pathological situations, RV pressure overload initially stimulates hypertrophy (RVH; figure 1A) and may lead to RV failure, a condition where the RV is symptomatically unable to fill or eject properly.6 It is of note, however, that to think of these as sequential processes is rather simplistic. It is argued that in RVH, remodelling and failure can occur simultaneously rather than be sequential events. (A) An overview of changes associated with RV pressure overload. Key triggers of RV pressure overload include pulmonary hypertension, RV outflow tract obstruction or RV being the systemic ventricle. RV pressure overload induces RVH that, through remodelling, leads to RV failure. It is of note, however, that RV failure is a continuous process and may begin as the time of hypertrophy and remodelling rather than being seen as a sequential process. (B) Effect of RVH-induced ischaemia. RVH is characterised by tissue hypoxia arising from ischaemia and microcirculatory insufficiency. Ischaemia-derived ROS, through the activation of transcription factors, drive the metabolic remodelling, contractile dysfunction and fibrosis that occur in RV failure. RVH, RV hypertrophy; PA, pulmonary artery; ROS, reactive oxygen species; MMPs, matrix metalloproteinases. During adaptive RVH, cardiac output, RV filling pressures and exercise capacity are normally preserved with minimal RV dilatation and fibrosis.6 However, in the hypertrophied RV there is a switch from aerobic energy production to a highly glycolytic metabolic profile, producing fewer molecules of ATP.7 Initially, overexpression of the GLUT-1 transporter can compensate for the energetic demand and thus produces an adaptive response. However, this ultimately becomes insufficient with reduction in energy supply, leading to maladaptive RVH and RV failure (figure 1B). It is controversial whether these metabolic changes are sustained during the progression into the maladaptive RVH, defined by significant reduction in cardiac output, elevation of RV filling pressure and increased fibrosis.6 This is associated with a rise in mitochondrial reactive oxygen species (ROS), which inhibits hypoxia inducible factor-α (HIF1α) and activates p53 pathways, both of which contribute to downregulation of pyruvate dehydrogenase kinase (PDK) and decreased glucose uptake7 (figure 2). As a consequence of HIF1α inhibition, angiogenesis is suppressed and the resultant ischaemia contributes to the rapid deterioration of RV function at the start of a maladaptive phase. Patients with advanced PAH manifest glycolytic activity as shown by persistent fluorodeoxyglucose uptake.8 Whether sustained or not, the mechanism of switching from aerobic energy to glycolytic energy use involves regulation of transcription factors (figure 2). 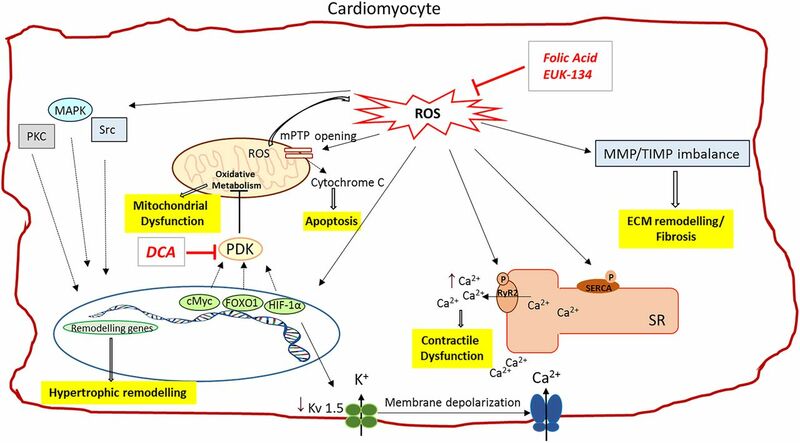 ROS-induced intracellular changes in cardiomyocyte. The increased intracellular ROS levels occurring in RV pressure overload affect several cardiomyocytes functions. ROS can stimulate pro-hypertrophic pathways by targeting key molecules in this process, such as MAPK, PKC and Src proteins. The redox-mediated activation of target transcription factors (HIF-1α, cMyc and FOXO1) might be responsible for the abnormal PKD activation, which inhibits mitochondrial oxidative metabolism, leading to mitochondrial dysfunction. Sustained ROS levels cause mPTP opening and mitochondrial membrane depolarisation. As a consequence, more ROS are produced and cytochrome c is release from mitochondria causing cell apoptosis. HIF-1α activation also decreases the activity of the O2-sensitive Kv channel (Kv1.5), resulting into membrane depolarisation and elevation of cytosolic Ca2+. The surplus of cytosolic Ca2+, in addition to the excessive Ca2+ released from the sarcoplasmic reticulum, as a consequence ROS-mediated RyR2 channel activation and SERCA inhibition, contributes to myocytes contractile dysfunction. ROS are also responsible for the MMPs/TIMPs imbalance that drives ECM remodelling and fibrosis. Antioxidant compounds, like Folic acid or EUK-134, by scavenging the ROS in excess, can help restore the impaired cardiomyocyte function. Furthermore, DCA can restore ROS production and mitochondrial membrane potential by inhibiting PDK and thereby improving glucose oxidation. ↑ indicates increase in levels; ↓ indicates decrease in level. ROS, reactive oxygen species; PCK, protein kinase C; MAPK, mitogen-activated protein kinase; mPTP, mitochondrial permeability transition pore; PDK, pyruvate dehydrogenase kinase; HIF, hypoxia-inducible factor; FOXO1, Forkhead box protein O1; cMyc, v-myc avin myelocytomastosis viral oncogene homologue; RyR2, ryanodine receptor 2; Kv 1.5, potassium voltage channel; SR, sarcoplasmic reticulum; SERCA, sarcoplasmic reticulum Ca2+-ATPase; MMP, matrix metalloproteinases; TIMP, tissue inhibitor metalloproteinases; ECM, extracellular matrix; DCA, dichloroacetate; PKD, protein kinase D. See text for more details. Metabolic changes and ischaemic stresses that occur during RV remodelling are also associated with accumulation of ROS.14 This can trigger key changes at the cellular and molecular level that can lead to contractile dysfunction, insufficient energy production and fibrosis (figure 2). Oxidative modifications of sarcoplasmic membrane channels can cause detrimental RyR2 activation and SERCA activity reduction, resulting in abnormalities of myocyte Ca2+ transients and contractile function.15 In addition, high ROS level leads to the generation of nitrotyrosine residues in tissue inhibitor of metalloproteinases (TIMPs) and liberates active matrix metalloproteinases (MMPs), inducing ventricular remodelling and fibrosis.13 Histological analysis of collagen content in RV samples from pulmonary artery constriction mice revealed a robust increase of ROS and a significant collagen accumulation, accompanied by increased MMP-2, −9 and −13 and decreased TIMP-4 protein levels, in comparison with control mice. Furthermore, ROS can act as the second messengers for many signalling molecules (ATII, transforming growth factor β1 (TGFβ1), TNFα and ET-1) to induce hypertrophic pathways involving MAPKs, PKC and Src within cardiomyocytes.12 Overall, elevated ROS levels can lead to cellular, molecular and structural changes causing further remodelling leading to failure. The problem of RV dysfunction is seen in RV obstruction or PAH exclusively. Patients with RV dysfunction are grouped together despite the fact that there are CHD that can trigger different functional, molecular and cellular remodelling in the RV. Furthermore, the assessment of RV function mainly revolves around techniques evaluating the RV structure and function such as echocardiography, Doppler, MRI and pulmonary angiography rather than investigating the cellular and the molecular abnormalities underlying the RV dysfunction in CHD. In recent years, with advances in molecular biology techniques such as deep sequencing and genome-wide microRNA (miRNA) profiling, there has been a growing trend in studying the genetic basis of congenital heart defect and in identifying suitable biomarkers for their diagnosis. Several studies have shown altered gene expression in signalling pathways that regulate heart development in children with TOF. For example, changes in vascular endothelium derived growth factor (VEGF) gene expression and several ECM proteins were recognised as contributory factors to TOF.15 Another study of gene expression in tissues from children with TOF identified a significant suppression of genes in the Notch and Wnt pathways, which are known to play critical roles in cardiac development.16 Although RVH is part of TOF, a genome-wide array study has shown clear distinction in gene expression between the TOF and other RVH phenotypes, including ventricular septal defect (VSD) and atrial septal defect (ASD), where the latter closely resembles the phenotype. The authors, in fact, observed distinct molecular portraits of TOF and RVH gene expression. While genes responsible for cardiac maldevelopment (a condition characterised by abnormal heart morphogenesis), like SNIP, A2BP1 and KIAA1437, were upregulated in the TOF group, genes involved in stress response and cell proliferation were more expressed in the RVH condition.17 Furthermore, a molecular transition from RV to LV characteristics occurs during RV adaptation to pressure overload, as genes dysregulated in RVH have an expression pattern similar to the one in normal LV tissue. Another key mediator in the RV adaptation to tissue hypoxia and mechanical stress is HIF1α. During acute hypoxia, HIF1α is cardioprotective due to its ability to induce angiogenic, metabolic and erythropoietic genes. However, under chronic hypoxic conditions, HIF1α upregulation can promote TGFβ1-mediated organ fibrosis.19 Interestingly, it was demonstrated that genetic variations in HIF1α could influence myocardial adaptation to hypoxia before repair and RV remodelling during postsurgical period. In a genotyping study of children with TOF, a higher number of functioning alleles were associated with slower progression of RV dilatation and freedom from pulmonary valve re-intervention in those with chronic RV volume loading.20 These findings suggested that hypoxia adaptation before TOF surgery, which depends on the functionality of the HIF1α pathway, could influence RV phenotype after repair. This example demonstrates the importance of pinpointing genetic determinants of RV remodelling that can be used to identify patients at-risk for adverse outcome and intervene before RV dysfunction becomes irreversible. 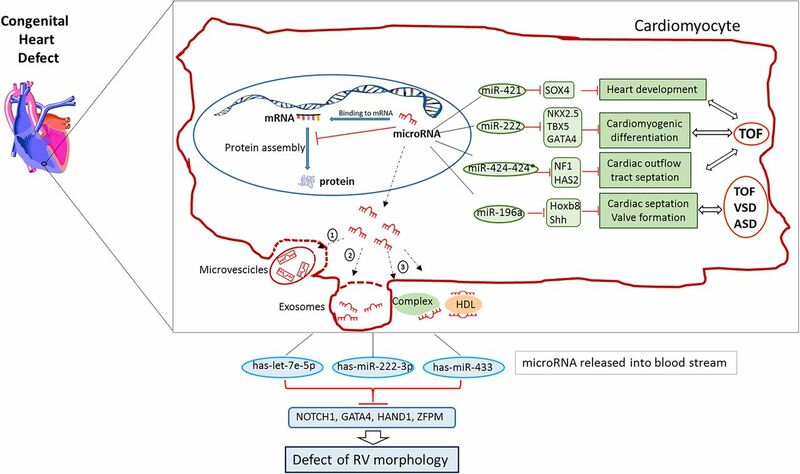 In cardiac tissue-based studies on the RV in CHD, 18 miRNAs were found to be differently regulated in RV outflow tract obstruction (RVOT) compared with RV outflow tracts from normal infants.22 In particular, 16 of these miRNAs targeted a series of genes involved in heart development and CHD, like miRNA-424 and miRNA-222, whose overexpression was correlated with the reduction of heart development associated genes NF1 and HAS2, suggesting that these miRNAs might be implicated in the abnormal heart development in TOF. Similarly, overexpression of miR-421 in RV tissue from children with TOF was associated with the pathology and its predicted interaction with SOX4 gene, essential for cardiac outflow tract formation, could sustain the malformation of this congenital disease.23 Additionally, miR-196a, identified as an upstream regulator of HOXB8–Sonic Hedgehog (Shh) pathway, important in heart development, was related to different CHDs, therefore contributing to defects in cardiac septation, outflow tract morphogenesis and valve formation.24 Whether the alteration of miRNA expression is responsible for the development of CHDs or is rather the consequence of the specific congenital defect has to be established. Circulating markers, such as miRNAs and plasma proteins, represent a potential tool to assess ventricle performance and adaptation, especially given the difficulty of evaluating single ventricle function using echocardiography. Cardiac circulating miRNAs are released into the blood stream in the form of exosomes, microvesicles or in conjunction with high-density lipoproteins and RNA-binding proteins, and are stable and measurable. Plasma miRNA expression is increasingly proposed as a potential biomarker of cardiovascular diseases or early diagnosis of myocardial infarction25 (figure 3). Dysregulated miRNAs in congenital heart diseases (CHDs). A figure showing the link between CHD and miRNAs in cardiomyocytes. Small number of miRNAs are upregulated in cardiomyocyte during CHD. These miRNAs can be released from the cell in microvesicles, by incorporation into exosomes, by linkage to high-density lipoproteins or bound to RNA-binding proteins. Dysregulated levels of miRNAs, crucial in RV development, are found in the bloodstream of children with VSD. The differentially expressed has-miR-222-3p, has-let-7e-5p and has-miR-433 bind with specific transcription factors (NOTCH1, GATA4, HAND1 and ZFPM) associated with RV morphogenesis. See text for more details. Only a few studies to date have examined circulating miRNA profile in adult patients with a systemic RV. Circulating miRNA profile was impaired in patients having the RV as the SV after transposition of the great arteries (TGA). Among the 24 miRNAs differently regulated, miRNA18a and miRNA486-5p correlated negatively with systemic ventricular contractility.27 Another study focusing on miRNA423_5p, identified as a biomarker for LV failure, showed that no difference in its expression appeared between adults with SV after atrial repair of TGA and healthy subjects.28 This is not surprising, given the different pathophysiology of systemic RV heart failure, and further strengthen the concept that the RV dysfunction has to be regarded independently from LV failure. To the best of our knowledge, no studies on circulating miRNA profile have been conducted on children with single ventricle physiology. Table 1 summarises the dysregulated miRNAs expressed in CHD. Plasma proteins can also be used as biomarkers for the diagnosis of heart failure in children with single ventricle, as well as other CHDs. B-type natriuretic peptide is a sensitive, clinically used biomarker for heart failure in children, but none of the other plasma proteins such as ET1, high sensitivity C reactive protein or cardiac troponin I has been reliably associated with heart failure in this patient population.29 Therefore, there is a compelling need to identify biomarkers for the diagnosis and the prediction of surgical outcome, given the difficulty to detect heart failure in this complex group of patients. As several components are involved in RVH and failure, different approaches can potentially be used to specifically target each of the impaired processes. Many studies indicate that PDK inhibitors, such as dichloroacetate (DCA), are beneficial in restoring pyruvate dehydrogenase (PDH) activity and restores the altered expression of GLUT1 transporter thus enhancing RV function in experimental models of RVH30 (figure 2). Modification of ROS activity might reduce fibrosis and cardiomyocyte dysfunction. This could be achieved with EUK-134, a superoxide dismutase and catalase mimetic. Similarly, folic acid improved MMP/TIMP balance and ameliorated mitochondrial dysfunction, thus resulting in protection of RV function in the presence of pulmonary hypertension.13 It has been suggested that the persistence of the fetal heart gene programme in Eisenmenger patients is one of the underlying mechanisms of the longer compensatory phase.7 The expression of fetal genes perhaps makes the Eisenmenger syndrome (ES) phenotype more able to compensate for the energetic demand in the adaptive response. However, why some patients compensate better than others in this condition is unclear. The genetic variation associated with CHD can help identify high-risk CHD children who are more prone to fail to fully benefit from surgical intervention. This highlights the urgency to develop alternative approaches such as newer pharmacogenetic therapies and an alternative surgical strategy in the high-risk patients to prevent maladaptive ventricular remodelling. An example of this might be to plan different timing of surgical intervention or different modes of cardiopulmonary protection in those who might benefit from a customised approach. RV failure, due to RVH, remains the major cause of morbidity and mortality in paediatric patients affected by CHDs. PAH, TOF and SV are the main causes of RVH in this population. 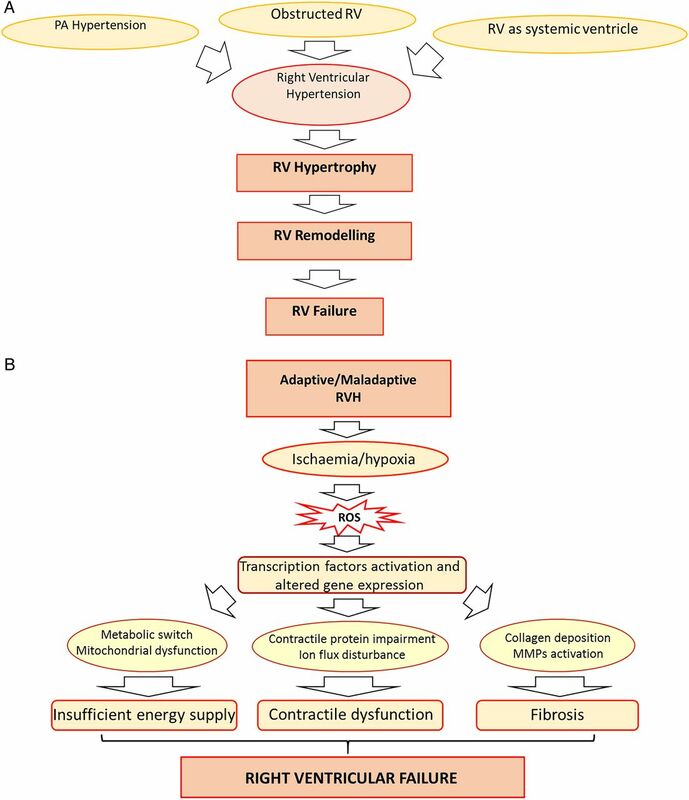 The transition from RVH to RV failure undergoes a remodelling phase characterised by structural and functional changes in cardiomyocytes, which are specific for the RV. The metabolic shift to aerobic glycolysis and the mitochondrial dysfunction that occur throughout the remodelling event lead to insufficient energy supply, while excitation-contraction coupling impairment and abnormal collagen deposition turn into contractile dysfunction and fibrosis, respectively. In addition, the altered activation of transcription factors (eg, HIF1α, FOXO1, cMyc) and ROS overproduction appear to mediate these remodelling events that ultimately lead to RV failure. Recent advances in molecular biology techniques revealed that dysregulation of biomarkers, such as miRNAs and plasma proteins, occur during RV remodelling. The changes in biomarker expression can be particularly useful in the study of RV remodelling in CHDs, as differences in the expression pattern have been reported depending on the aetiology of the defect. Therefore, the identification of the specific signalling pathways activated in the major types of malformations (VSD, TOF, SV), as a result of RV remodelling, will help suggest therapeutic strategies to improve RV function. Furthermore, this knowledge will enable designing specific intervention for each pathology and tailoring therapies with enhanced patient benefit in the future.
. Oxidative stress and ischemic myocardial syndromes. Med Sci Monit 2009;15:RA209–19. Contributors DI drafted the manuscript with assistance from M-SS, MG, SJG, MC and RMT who edited, supervised and approved the final version. Funding This research was supported by Sparks—the Children's Medical Research Charity (13BTL01) and the NIHR Bristol Cardiovascular Biomedical Research Unit.